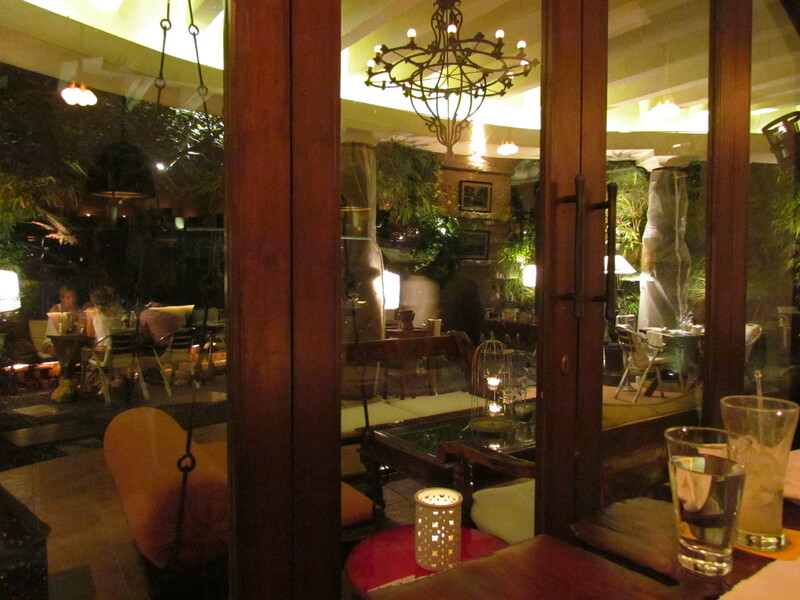 A ‘romantic restaurant’ with beautiful ambience, both indoor & outdoor seating, good service, a pretty good bar & very good food. 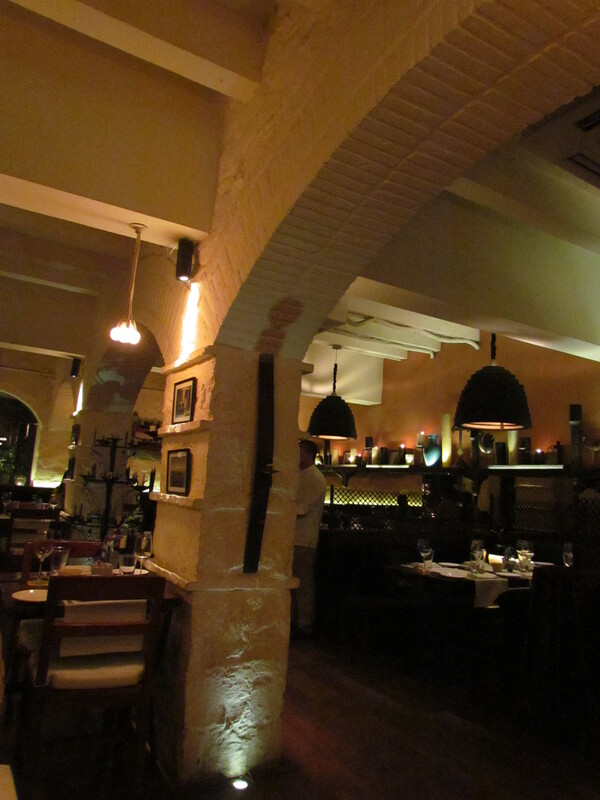 The Restaurant is run by celebrity Chef Marut Sikka who also runs the excellent Awadhi Cuisine Restaurant in Vasant Kunj – Kainoosh. Many of my friends have come across Marut in person as he usually takes time off other affairs & interacts with Guests in his restaurants. I haven’t met him in person ever. 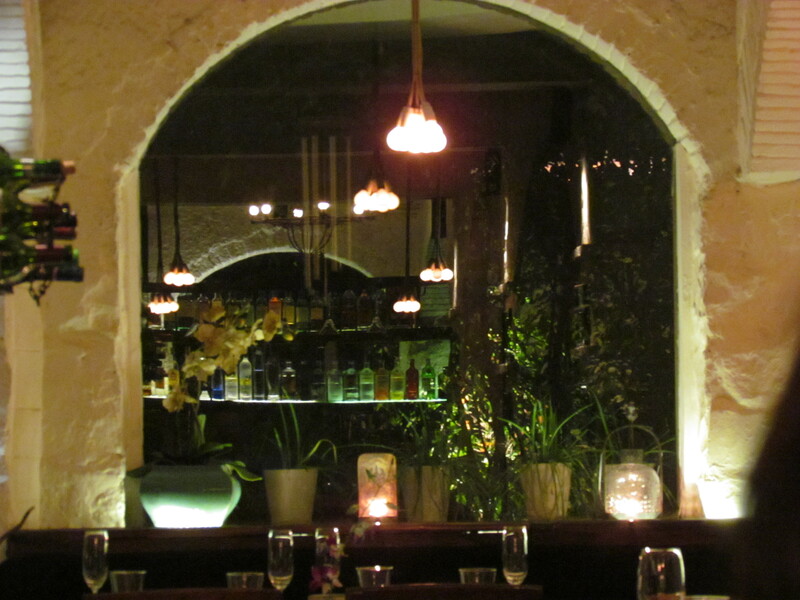 The restaurant is situated in ‘Garden of Five senses’ located in a village in Delhi. During winter days the garden is quite good to be. It has quite a few designer boutiques & a handful of restaurants. During evenings pretty much the restaurants are the only active place in the garden. The entry to the restaurant is thru a pebbled curvaceous path and at one point there is a welcome desk. 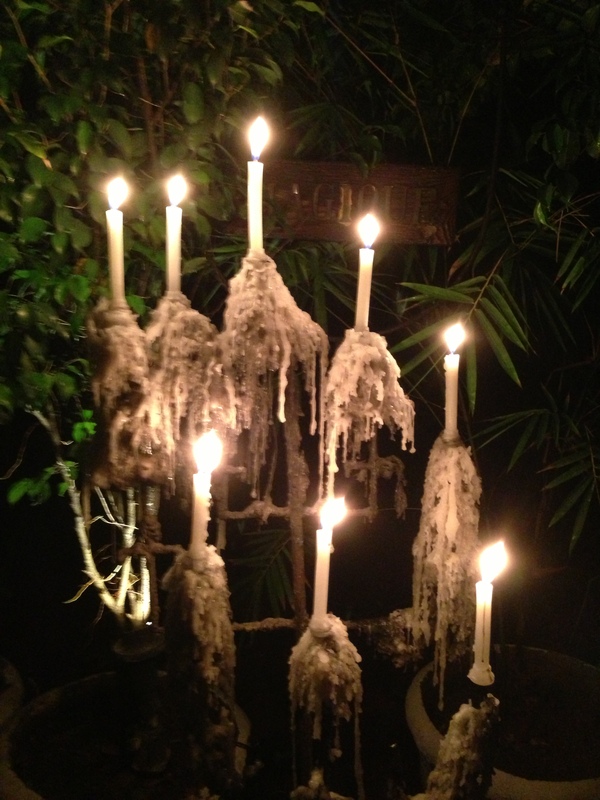 Beside the welcome desk is a candle stand in which the wax from earlier evenings were never removed. Magiqueal & somewhat eerie (if u stretch ur imagination). The seating can b outside as well as inside. 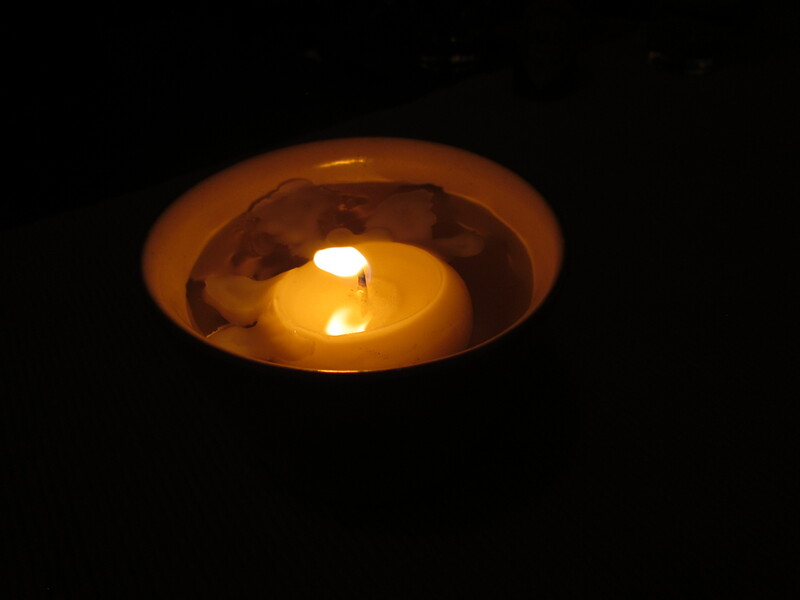 We chose inside as I had to click pics for u all – outside the light was even lesser (I do not use flash). 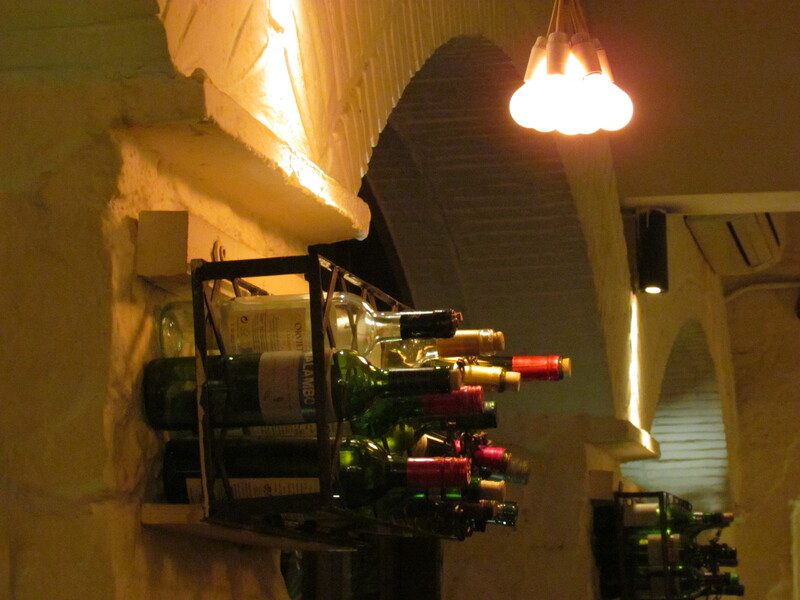 The inside of the restaurant had a old fashioned wall, wine bottles strutting out of cases in the wall, some nice bottles kept in a row n the top, some intricate woodwork & a small but good looking bar area in the corner. The service was very good. The guy serving us was warm, knowledgeable & made positive contribution to our evening. The menu card was beautiful. 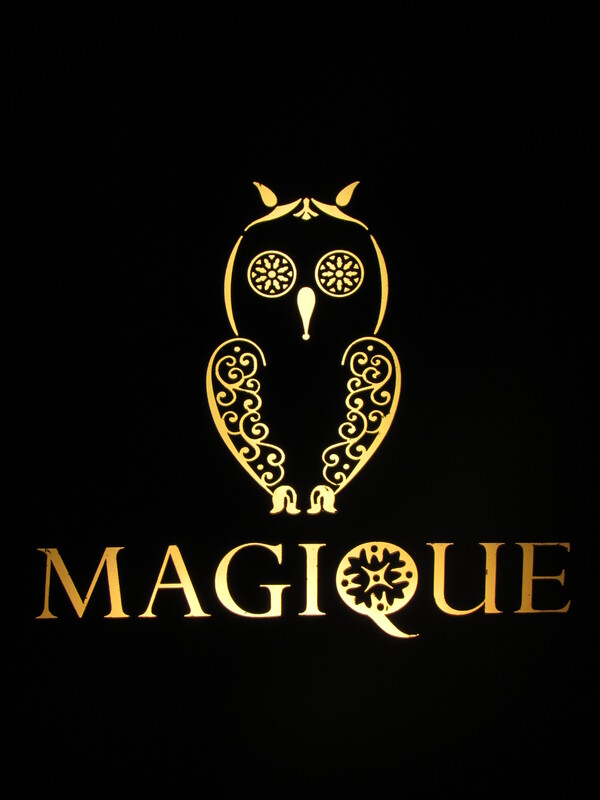 It had a colorful version of the Magique logo –the owl. The dishes were pretty well explained inside – no pictures though. Relatively small menu but not very small as well. Loved the food & the drinks. Needless to say, I will revisit. 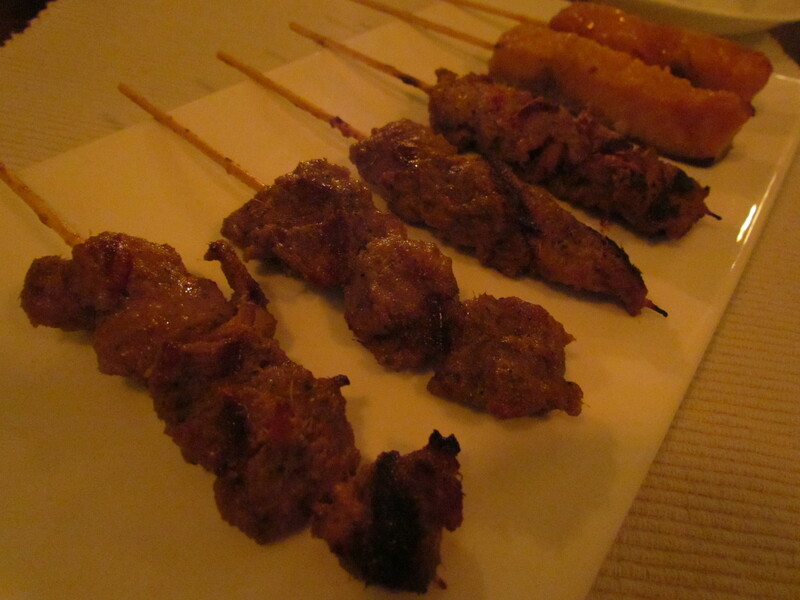 The marinated skewers of lamb (spicy lamb) was super duper soft, almost melt in the mouth. It was just awesome. It had perfect spice, perfect texture & was too good to taste. It just left us speechless. I rate this at 4.75/5. In the Salmon teriyaki skewer, a Japanese sauce was used. Very very intense & just outstanding. If u like salmon u wud love it. If u do not, u will not b able to finish even one skewer. Either u love it or u hate it. I loved it. 4.5/5 again. Crispy Shizo Prawn Izakaya with lemon wasabi dip The Prawn dish was something that I was avoiding to order coz it sounded like tempura (tempura is something that we had many times, we like it but now we have over eaten it). The guy serving us insisted that we try this and he was right. Visually it looked very different than tempura and was served with a sauce dip. 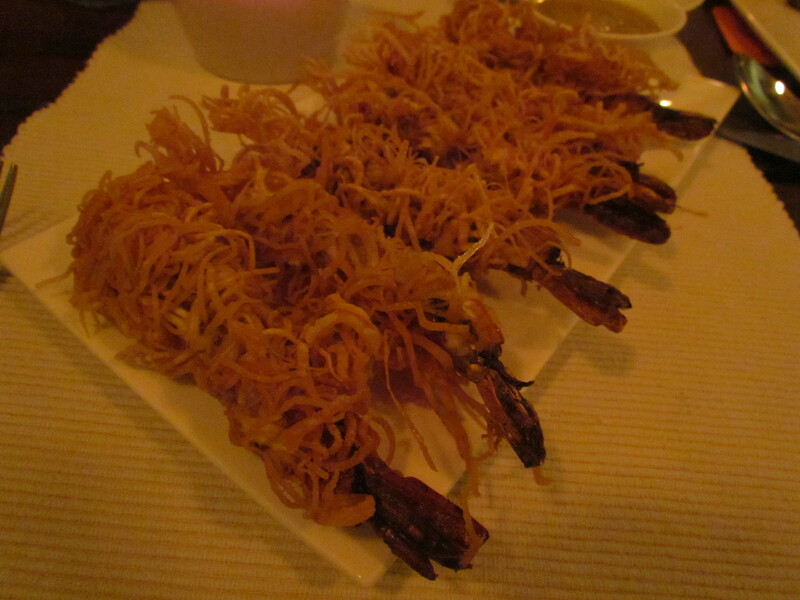 The prawn was in tehe center & it was deep fried with a batter coating thus leaving the prawn juicy, soft & very tasty. A dip into the dip and the arrival of prawn in the mouth …… gave an expression that can be somewhat described as Aaaaahhhhhhhhhhooooooowowwwwwww…..the wasabi base of the sauce straight hit the sinuses, attacked the full nasal pipe and then it was pure ecstasy. Wow. Once again I give this a 4.5/5. For drinks we ordered High C – It was Mint, lemon & sugar topped with sparkling water. 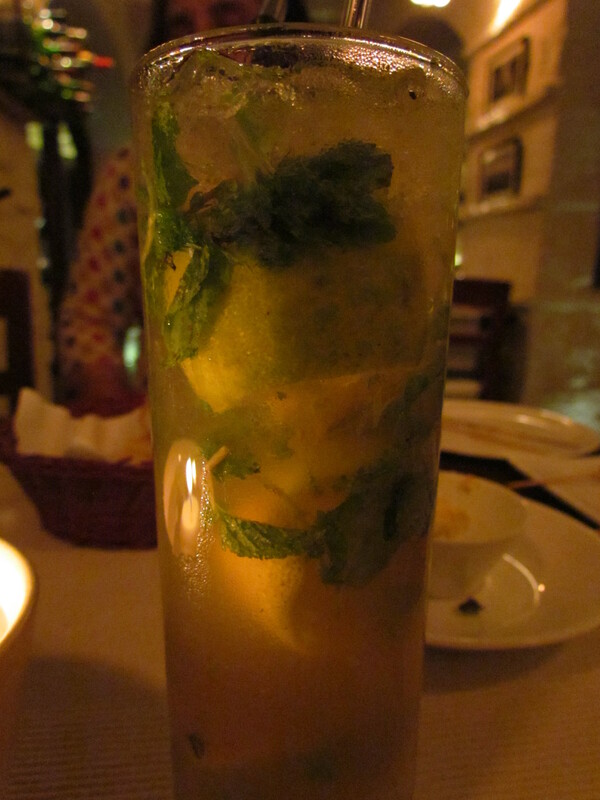 This Lemon based drink was basically virgin mojito – but very very well made. The grains of brown sugar wud reach the tongue with every sip. The hint of mint was excellent & there was a good perfect balance of sweet and sour – loved it & rate it 4.5/5. 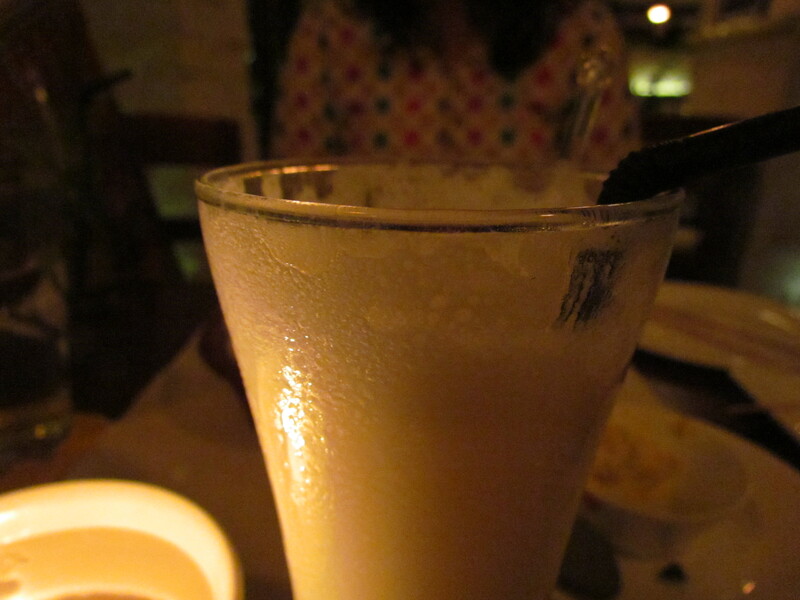 The second drink we ordered was Ambrosia – It had a Yoghurt base & to it was added lychee nectar, coconut milk & honey blended with crushed ice. It was Good, balanced , different & of course very tasty. I rate this 4/5. 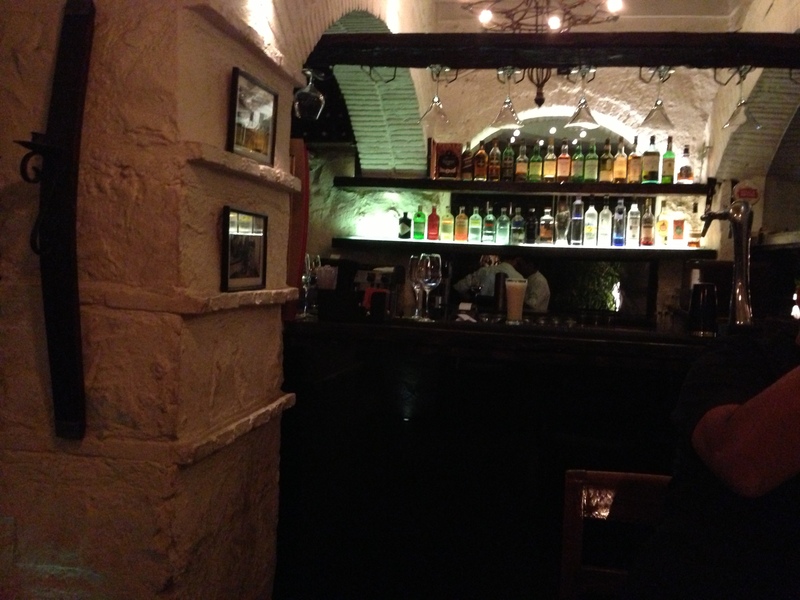 Our third drink was Starburst – Apple juice, Camphor syrup, fresh lime served on ice. This was different & good but way short of greatness. The camphor was of course untraceable. I give this drink a 3/5. 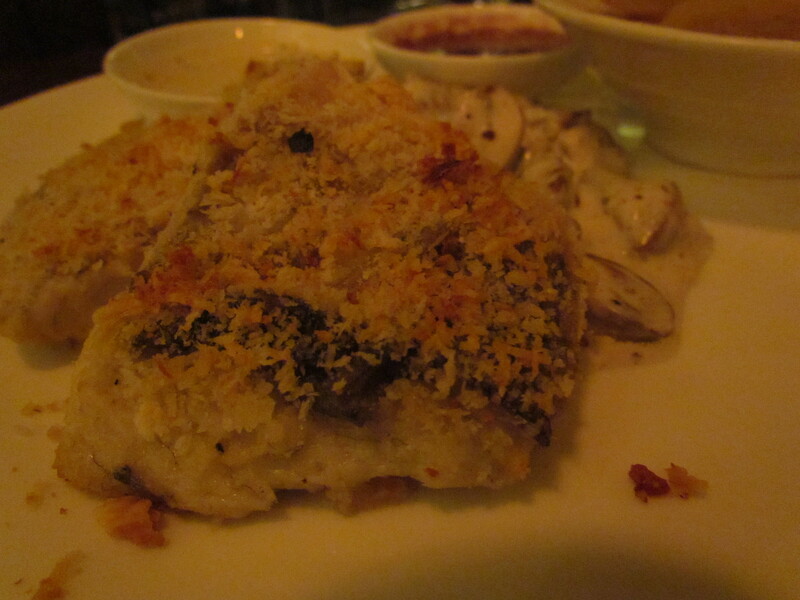 For main course we had Parmesan encrusted Grilled seabass with creamy Dill & Mustard sauce with Boulangerie potatoes. 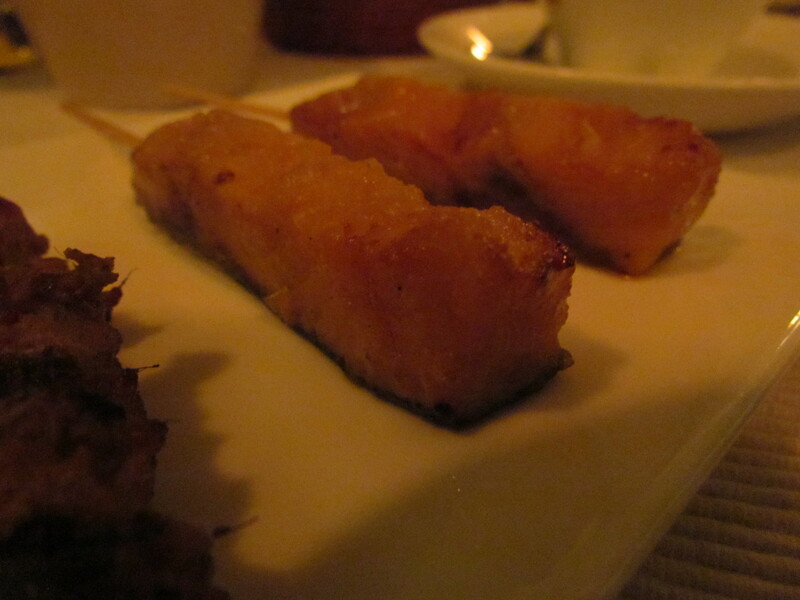 The Fish was soft, flaky, somewhat juicy and nice. The cheese shaving on the crust gave it an interesting texture. The sides of the fish were mildly charred on the pan …. Slightly brownish. Enjoyable. The sauce dip with the fish was excellent. It completely changed the experience of the fish. Give this dish a 4/5. 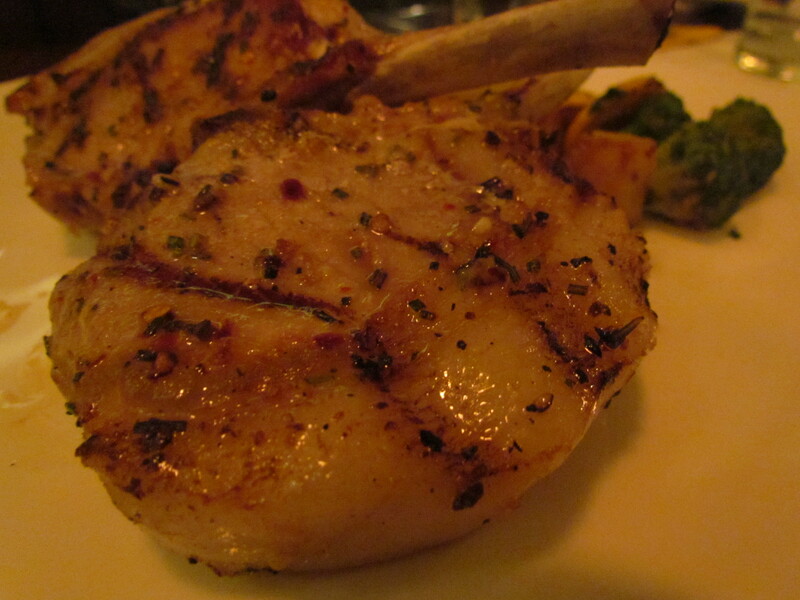 The second main course was Chargrilled Pork chops with Onion relish & Garlic roast potatoes. The pork chops were just perfect. Just the right amount of softness – just the right texture. The date based dip was slightly sweet & was nice. I wud call it very good but it wud not qualify as great. I give this a 4/5. 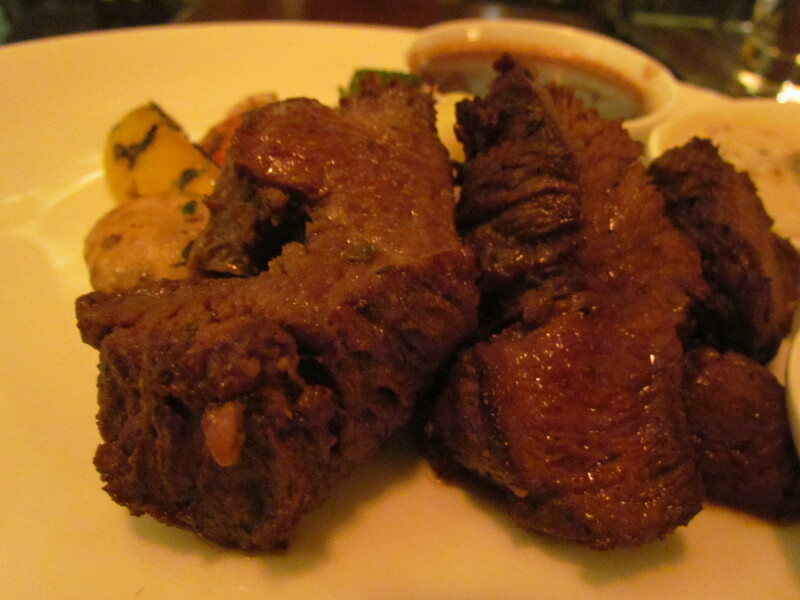 Trio of Tenderloin medallions – with Pepper sauce, Mustard sauce, Mushroom sauce. This was served with garlic mashed potatoes & sautéed vegetables. This Tenderloin dish was awesome. Once again it was perfectly done meat. There were 3 sauce dips – loved each and every one of them. Grilled veggies were charred on the outside but still crunchy. Loved the mashed potato a lot. Give this dish 4.75/5. For dessert we had old fashioned cake. 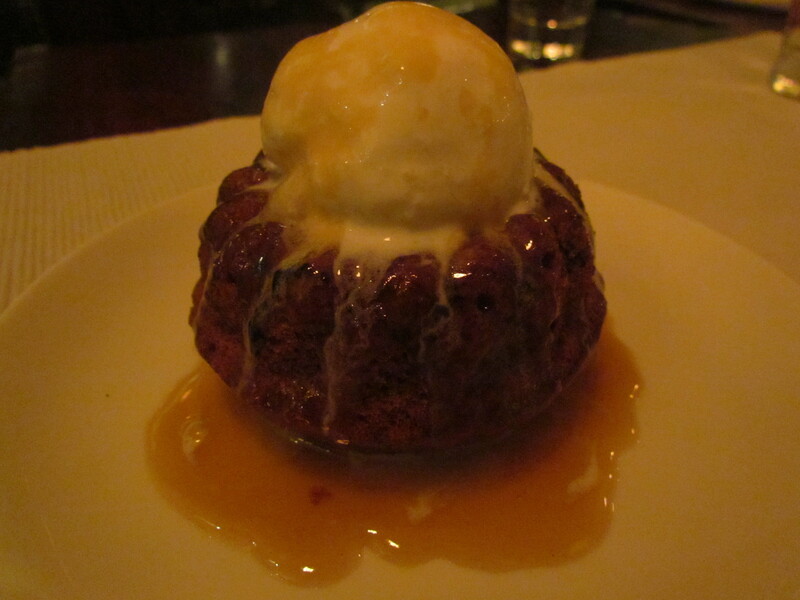 It was very nice – if was not soft and smooth like the modern day cakes found all over our country, but less soft, somewhat grainy in texture and quite intense to taste. Toffee sauce poured atop was too good and this whole combo with a decent vanilla ice cream tasted very good. I again give this a 4/5. 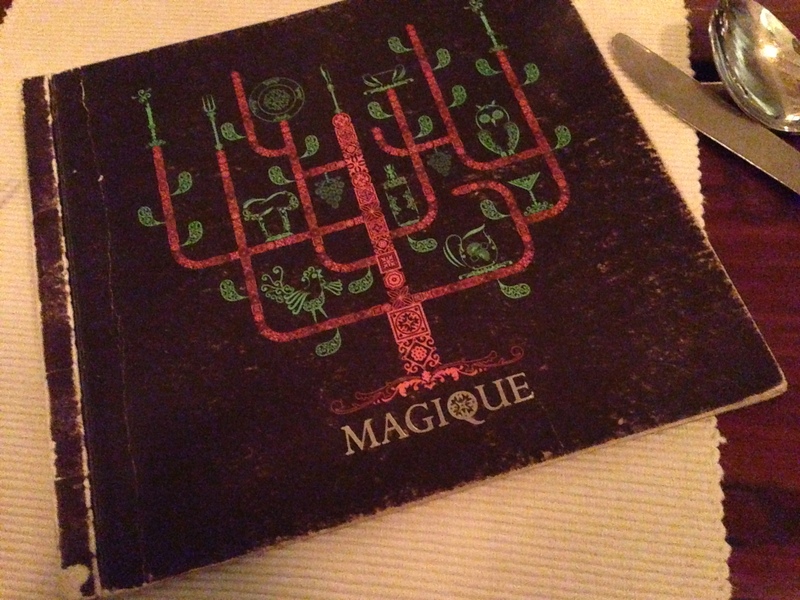 Overall, We had an amazing evening at Magique. Look forward to more such in future.